Gregory Feifer, a former correspondent of National Public Radio (NPR) and the author of the book “The Great Gamble: The Soviet War in Afghanistan” talked to RBTH to share his views on the Afghan crisis and NATO-Russia cooperation. That’s why Feifer decided to write a book, “The Great gamble: The Soviet War in Afghanistan.” He started it in 2005 and finished in 2008. Russia Beyond the Headlines got in touch with Feifer to discuss the current situation in Afghanistan and NATO-Russia cooperation amidst the upcoming withdrawal of NATO troops from the country. Russia Beyond the Headlines: Could you say why your book is relevant to today’s events in Afghanistan? Gregory Feifer: I wrote it because I heard many fascinating, little-known stories that I believed deserved to be told. It was a good time to do it – enough time had passed since the war for veterans to talk relatively openly, and some of the key figures have died since I interviewed them. I also think changing Russian social attitudes are again coloring perception of the war – criticism of the Soviet Union these days is often seen as unpatriotic. That the topic was relevant to current events because NATO was conducting a campaign in Afghanistan was added incentive. There are huge differences between the Soviet war and today's, but enough obvious similarities, I believed, to generate interest in the topic. RBTH: So, why do you think the Soviet Union launched the military campaign in Afghanistan? G. F.: Most Americans assume the USSR invaded Afghanistan as a naked land-grab – part of its drive to acquire a warm - water port. However, there were other events going on at the time that influenced the decision, including the Iranian Revolution, which made the Kremlin concerned about the Soviet security. The Kremlin actually had spent a year turning down requests by the communist government in Afghanistan to send in forces to help put down rebellion. No actual decision to invade was taken; rather, it was the result of a series of orders to reinforce Moscow's part in a coup to replace one communist leader with another. RBTH: How, from you point of view, can NATO apply Soviet experience in its operation? Why does it need it? G.F.: The Soviet withdrawal was one of the most successful aspects – if not the most successful – of the war in Afghanistan. NATO can directly apply lessons learned from the experience, especially the practice of negotiating with rebels to allow passage of forces from the country. RBTH: Could you be more specific? What other lessons can NATO take into account and directly apply? G.F.: Much of the Soviet campaign was a lesson in how not to conduct a war in Afghanistan or anywhere else. Having sent troops there to shore up a communist government in a country where much of society lived according to medieval codes, Moscow ever fully understood the nature of the civil conflict in which it intervened. Troops were poorly trained, ill-equipped and spent much of their time killing civilians. The military and political leadership was little better. After [Mikhail] Gorbachev made the decision to withdraw in 1985, it took four years to actually accomplish it. However, once the process started, it went surprisingly well. RBTH: You said that the Soviet withdrawal was one of the most successful aspect in the Afghan war. Why do you think so? G.F.: The plan to carry out phased withdrawals over several months in different areas of the country was well thought-out. Tactics were often left to military commanders on the ground, who were allowed to negotiate with the mujahideen to minimize casualties. RBTH: Have you changed your mind about the Russia-NATO dialogue since the time you wrote your book? G.F.: If anything, the quality of the Russia-NATO dialogue has deteriorated since I wrote the book. However, it was already poor then, especially when ties were all but severed after the Russia-Georgia [conflict] in 2008. RBTH: Could you make forecasts: Will NATO succeed in withdrawing its troops from Afghanistan, and what might hamper it? What consequences should we expect after the withdrawal? G.F.: NATO's forces in Afghanistan are far superior in training and materiel than the Soviet army was; I think the withdrawal should proceed relatively smoothly. 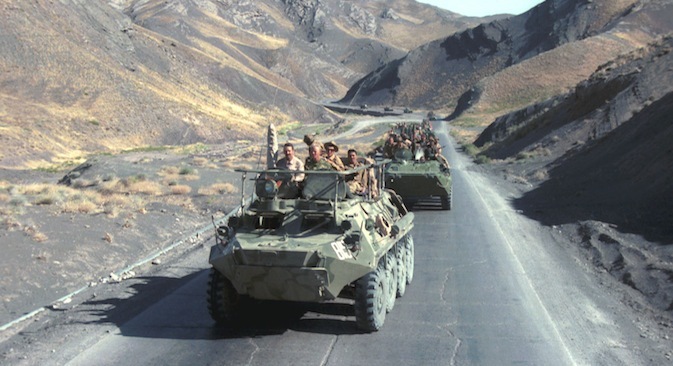 As for the aftermath –the Afghan communist regime defied all predictions by outlasting the USSR, thanks in large part to massive infusions of financial and material aid that ended with the Soviet collapse. I'm certain Washington and Brussels are very much aware of that. Although the odds are clearly against the Karzai regime's ability to maintain stability by itself, I'd hesitate to predict what will happen. The exit of NATO forces will create a new reality on the ground, with constraints that will force the government to act differently than it does now.